I’m excited to announce that the DVD companion to my book Raising The Bar is finished and will be available this November. The DVD will include all the most important exercises and progressions from the book, plus a few new moves and new trainer tips. Seeing the exercises performed in real time will be helpful for a lot of people, plus there are several entertaining musical interludes! It’s almost like an hour long version of these two youtube videos, but better and shot in high definition. I’m also excited to announce that I will be leading a bodyweight strength workshop at Q Crossfit in Randolph, NJ on Jan 12, 2013. 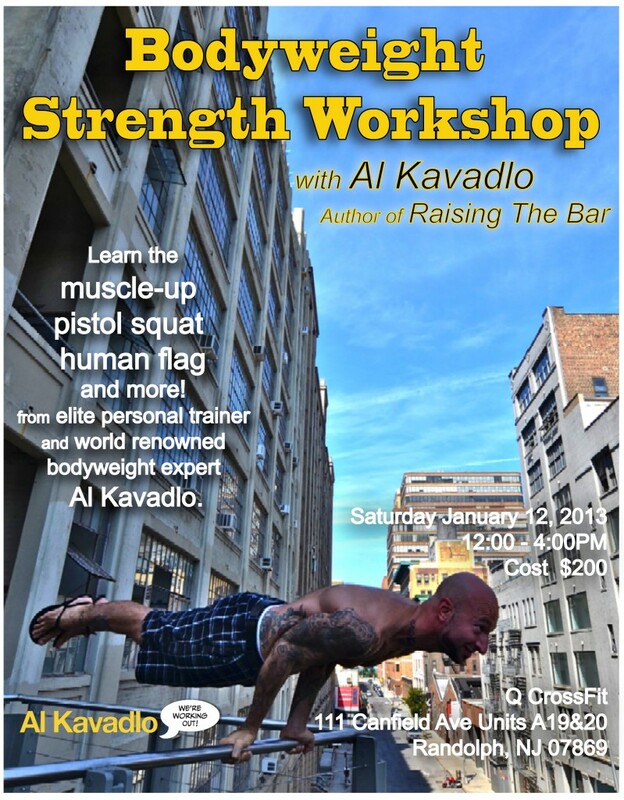 The workshop will cover the muscle-up, elbow lever, pistol squat, human flag and more. Space is limited so reserve your spot asap! October 2012 marks three years since I started this blog. In that time, I’ve written over 250 posts, had over 300,000 unique visitors and reached over 2,000,000 total views on Youtube. I’ve gone from being a successful local personal trainer who started a blog in his free time, to a full-time writer/blogger/trainer with followers in dozens of countries. I’ve gotten messages from people all over the world who I’ve inspired to work out and empowered to improve their lives. It is truly a blessing to connect with so many people in such a positive way. In the last three years, I’ve not only grown as a coach and a writer, but also as a student of movement. Thanks for stopping by, commenting and showing your support! I know what is on my Christmas wish list!!! RIght on, Rob! Hope Santa comes through for you! Thanks for putting yourself out there! I showed some of your videos to my Dad. He bought the new book the same day and now has a pull-up bar in his garage. He’s 67 and eagerly looking forward to his first pull-up in almost 50 years. Thanks for this great comment, Jimmy! I’m psyched for you dad! Al, your DVD sounds totally badass! I see big things for you in 2013, my friend :). Thanks, Robby! Onward and upward! I like your blog. I read all the updates. And I am going to buy your book and dvd soon enough 😉 I am begginer in calisthenics and enjoy your work. Keep it going. Thanks, Pawel! Appreciate your support! Al, thank you for the inspiration. I’ve taken a different approach to fitness and dig the positive vibes. Look forward to the DVD. Hi Al! I’m also doing my workout using bodyweight exercises only as well as QiGong. I bought your book for kindle and it is really awesome! Now i’m frequently out on the playground because there is a pullup bar 🙂 Also one might see me do pullups at our carport or at our stairs. I hope the DVD will be available in Europe, too. We have another region code and my dvd player is not able to play NTSC DVDs. I also bought Convict Conditioning 1&2 where I first saw you on the pictures. Keep up the good work and I hope you will release other books too. For what it’s worth, I live in Taiwan, and they sell DVD players here that can play burned discs as well as USB drives, and any region code you can think of, you just have to check out the details and maybe you could get another model (the DVD will totally be worth it!). Also, I know that I have the option to change the region code on my MacBook several times before its fixed for good. Good luck man! Al for president!……I hope there is a canadain workshop in the future! I’m hoping to do a workshop in Canada in 2013. A run for president is a lot less likely, though I appreciate your enthusiasm! Hi Al. First of all, I’d like to congratulate you for the great inspiration and source of knowledge you represent. There is no such thing as absolute truth, but in your opinion, are the basic planks the best way for seriously work your core when you simply have no equipment at all? Thanks. Hope you keep the good work! The plank is great, but the L sit and its progressions the V sit and manna are even better and require just as little equipment. The Lalanne push up is also excellent. Beyond that the planche works the entire upper body to a very high degree and requires nothing. It is possible to work pretty much anything to a high level with practically no equipment; the only limits are your imagination and dedication! Just to add onto Robby’s comment, planks are a great place to start, but once you can hold one for a minute or so, there’s a point of diminishing returns with longer hold times. That’s when it’s time to look into L-sit variations and moving up from there. Thank you all guys! I’ts just great to know opinions and experiences from the ones who practice calisthenics at this point. 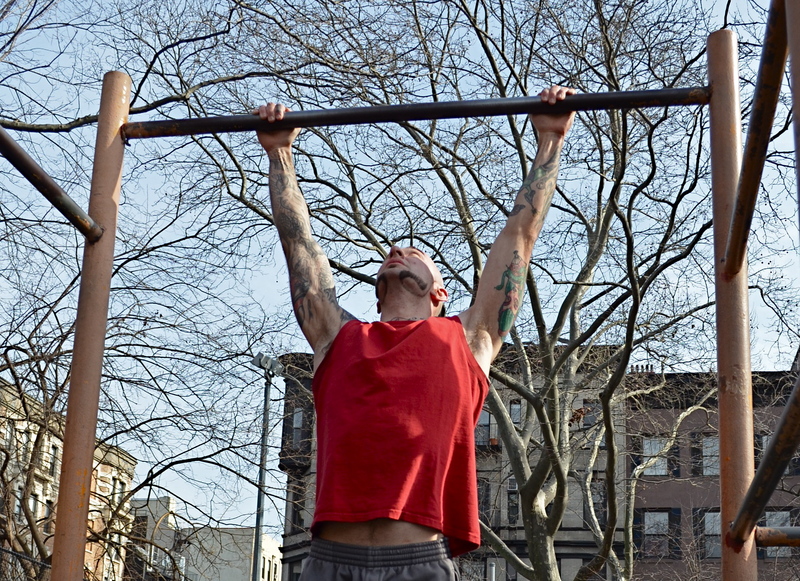 Kavadlo is one of the bibles to the bodyweight enthusiastics. Thanks, Elky! My moderators are pretty great ain’t they? Yeah. lt’s all great here. Hope you do a workshop in the Virginia Beach area….would love to participate. I hope to do workshops all over the world! If you know any gym managers over there, tell ’em to hit me up! It would be my pleasure…..I would love to attend ! Al, I gotta hand it to you, the book was unbarlieveable, and I’m looking forward to the companion DVD! I’ve been following your website for a while, and I’ve learned a lot. You’ve inspired me to pursue a career as a PT (I’ve been an ESL teacher for years, but this is my chance to share what I’m really passionate about). If I’m ever in New York, I hope I get the change to get in some reps with the man! Keep the awesome material coming, it’s gold, pure gold! “unbarlieveable” = brilliant! @AlKavadlo:disqus should totally use that for the title of a blog post some day. Thanks for following the site and, more importantly, applying the info. Cheers! Yeah Un-bar-lievable is a keeper. Apparently ESL teacher to PT is a fairly common career path! Thanks, lol, I have a few clever moments now and again. Andy, I teach in Taiwan, and I find the work extremely rewarding, though working with adults is something I’ve always wanted to do, and now that I’m moving back to the states next year, I figured it would be the perfect time to start a new career. Al, correct me if I’m mistaken, but I remember reading on your site that you worked in ESL for a while? It’s definitely work that builds up your patience and tolerance, two important attributes indeed! You are not mistaken, Logan – that’s what I was referring to! And yes, the patience required to teach ESL is very good prep for personal training! Truly, and teaching is itself a great skill to have. It’s not for everyone, but I sure have a lot of respect for anyone who’s in the field! Thanks, Logan! And nice word play! Very excited for the DVD. Hope I can find a way to ship it here to Saudi Arabia. Thanks, Hass! Once the DVD is out send me an email if you’re having trouble finding it – I’ll ship you one myself if I have to! Yeah the comments are powered by Disqus but the forums are through WordPress. Good idea to keep things consistent! Yo Al I wish you and all the East Coasters a quick recovery from this storm. I hope you are doing alright and at least have power etc. Stay strong as I know you will. Knowing your posts you’ll still find a way to get in a workout even in this situation. Take care bro! Thanks, Igor! Me and my family are okay! Seriously scary stuff, you guys look out for yourselves! I just want to let you know you have a fan in South Korea. I am an American living and studying sports pedology in Asia. I use your website to implicate new workout regimens daily. The globo gyms here are well horrendous. Calisthenics are by far the easiest (i say that tentatively) and best way to stay in shape while traveling. Thanks for the guidance and keep inspiring. Thanks, Deano! 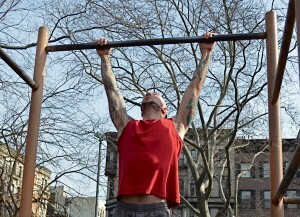 Keep spreading the word about calisthenics! Can I buy your book? I’m from Brazil. Great job bro, keep doing it.